The report predicts the Paper Coating Additives Market to grow with a CAGR of 0.6 % over the period of 2017 - 2023. The global market for Paper Coating Additives at $2402.4 million in 2017 is anticipated to grow in 2023. APAC has the major market in paper coating additives among all the regions and is estimated to increase its market with a growing CAGR of 1.1% as the coated paper production in APAC is increasing. 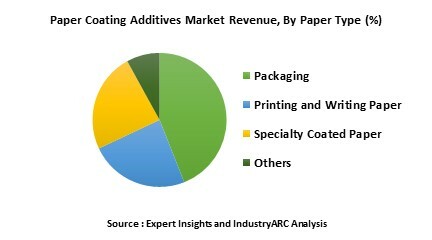 The dispersants additives in paper coating additives had a market share more than around 42% in global revenue share. Same way in volume analysis, types of additives such as dispersant, rheology modifier, biocides and lubricants hold 59% of the global volume share in 2017. Defoamers type’s additive is the least growing segment in the present market. The types are estimated to grow since 2017 in Europe and Americas due to demand from packaging industry and applications relating to graphic papers. What are the major applications of Paper Coating Additives? Paper coating present unique features to the surface of the paper to provide a benefit and qualities that can’t give by uncoated paper. The type of products in paper coatings is called as preservatives, as they this preserves the products for longer periods against microbes. Dispersant is the leading type of paper coating additive, Sodium polyacrylates is the effective dispersants used in the paper industry. Special reagents and additives are needed to provide a best shiny surface to the paper and the performance required. The Coating Additives are mostly used in high solids formulation in the paper coating process. The additives in high solids are the leading formulation in the market since 2017. The powder coating formulation is the least growing market. Additives also helps in enhancing the coating process, composition of coating color and intensify the surface of the paper. These additives improves water repellency and surface slips when the paper surface is exposed to water. Infrastructure & Investment: Expansion and Innovation in various geographies is a key strategy followed by major players. Predominantly in Asia Pacific regions, Exhaustion of paper is promptly increasing due to restriction on usage of plastic and it has intensified the growth of demand for the paper coating material. Recently, Dow Chemical Company has opened their first and new coating material plant in Sichuan, located at Western China. This plant has been launched to produce additives and acrylic resin to meet the demand from industrial coating market. This is Dow’s First initiative in terms of exploring western china industrial coating market and the firm strongly believes that infrastructure development and supportable urbanization will provides enormous business opportunities. In last October, the company was offered a financial support from provincial government of Sichuan of about RMB 3.2 million. Innovation: pH neutralizer being the most influential catalyst in the implementation of waterborne coatings. Based on the method of formulation, manufacturers will try various possibilities for modifying pH in their method of formulation. The newly developed amino alkane neutralizer, dimethylmethoxypropylamine has been introduced for prospective use in automotive and industrial coatings. This major physical properties of this neutralizer includes maintaining constant boiling point and composition throughout distillation and is fully forming a homogeneous mixture when added together with water. Research & Development: Evonik, one of the predominant player in industrial coating has recently opened its first coating additives research laboratory in Turkey. This research laboratory will provides customer support with an innovative development in surface coatings throughout the Middle East. The customer support facility will provide a feedback and future requisites on printing ink and coating applications, to the researcher to compose, implement and experiment a diversified printing inks and coatings in radiation curing formats or Surface-based and water based method formulation. The key players operating in the Paper Coating Additive Market are Kernow Coatings, DuPont, Zigma International, Michelman Inc., Omya AG., Imerys SA., BASF SE., DoW Chemicals., Penford Corporation., Archroma and other 10 more companies.